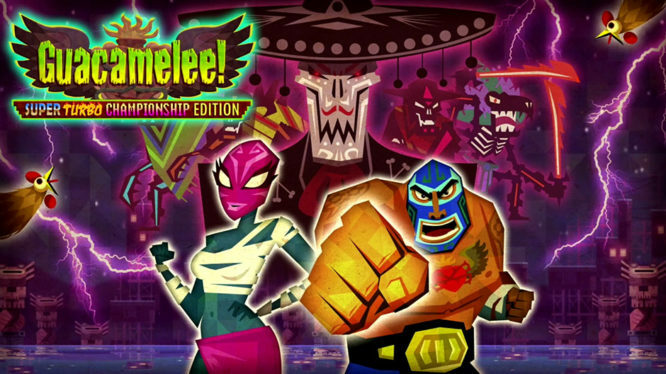 The defintive version of Guacamelee! frog slams its way onto Switch. Luchador themed Metroidvania Guacamelee! Super Turbo Championship Edition launches on the Nintendo Switch eShop today, with the sequel due in December. In Guacamelee! you play as Juan, a farmer who is killed trying to save El Presidente’s daughter from the evil skeleton Calaca. In the Land of the Dead, Juan finds a powerful mask and is transformed into a Luchador. Armed with nothing but his wrestling moves, Juan must traverse across Mexico, move between the lands of the living and the dead, and save El Presidente’s daughter. The wrestling moves Juan uses to fight enemies can also be used as a tool to traverse the world and overcome obstacles (in classic Metroidvania style). The combat, movement and the game’s sense of humour made it a fan favourite when it originally launched in 2013. Co-op fans will be pleased to hear that Guacamelee! on Nintendo Switch also features same-screen co-op play. Supporting up to 4 players, Guacamelee! uses a drop in/out system that allows your friends to lend a helping hand or leave whenever they want. The game’s sequel, “Guacamelee! 2” will also be coming to Nintendo Switch this year, with a tentative date of December 2018. In Guacamelee! 2, seven years have passed since the end of the first game and Juan is married with children. However, a looming evil that threatens the entire “Mexiverse” brings him out of retirement for one last fight. The sequel features many of the same wrestling move upgrades as the first game, but expands on some of them – giving Juan’s chicken transformation a whole combat moveset of its own. Guacamelee! launches today on the Nintendo eShop for £11.99 / €11,99 with an North American price yet to be announced. Grab a double serving of Guacamelee! with this upcoming collection.